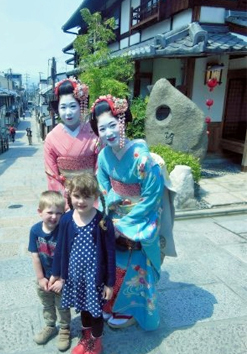 As regular followers of this blog will know, we are a family obsessed with all things Japanese. So when we light up a BBQ you won’t find boring old beef burgers and sausages. It’s yakitori for us. My five year old son mentioned eating yakitori in his school diary and had to explain exactly what it was to the class. His teachers must think we’re a right bunch of pretentious ponces. However, although yakitori sounds fancy and exotic, it’s really just little bits of chicken on a skewer (a kebab basically) brushed with a special sauce. The recipe comes from this book. Mix all the ingredients above together in a pan and then simmer over a medium heat until the mixture thickens (don’t let it thicken too much however or you’ll have soy sauce flavoured caramel). Set aside until you are ready to use. Thread small cubes of chicken onto skewers. Season with salt and pepper then barbecue until cooked through. Once cooked and still hot, brush liberally with the yakitori sauce and serve straight away. Store any leftover sauce in a clean jar in the fridge. It keeps very well. You don’t have to use chicken. You can use the sauce on other meats such as beef and pork. Or try with fish or vegetables. Another recipe I’ve tried recently is this from James Martin. He uses beef foreribs which he cooks in the oven, however I’ve adapted it to use brisket (cheaper and easier to get hold of) and then cook it on the barbecue. I don’t have a photograph of this dish – sorry. It’s tasty but not very photogenic, if you want to imagine what it looks like then just think of black squares. There’s not even a picture in the ‘Saturday Kitchen at Home’ book it comes from. First place the brisket in a large saucepan with the peppercorns, bay, parsley, onion and carrot. Fill the pan with water to just cover the brisket. Bring to the boil and simmer for 3 hours with a lid partly on. Skim off any foam that forms on the surface. When cooked and tender leave the brisket to cool in the stock. Drain, unroll, cut off most of the fat and cut into large wedges. You can save the stock for soup or risotto. Place all the ingredients for the glaze in a pan and bring to a simmer. Take the chunks of brisket and dip in the sauce to coat. Barbecue the pieces of brisket until warmed through basting with more sauce halfway through. 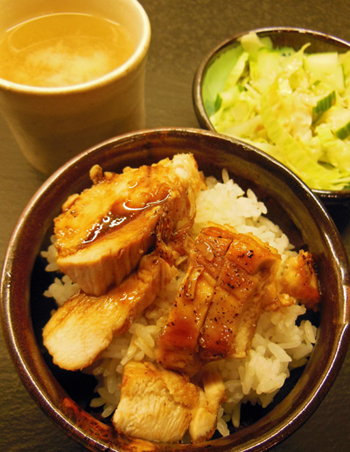 Just like the yakitori sauce, you can store any leftover sauce in the fridge in a clean jar. Poor old James Martin. I like his recipes but he’s totally demeaned himself with those deeply embarrassing ASDA adverts. So I’m back from Japan and have spent the last week in a jet lagged haze barely able to put two words together let alone cook a decent meal. And I’ve been slightly demoralised in the kitchen having been spoilt by Japanese cuisine which for me is absolute food heaven. The high end of Japanese dining is not really accessible to clueless westerners who can only speak two words of Japanese (arigatou gozaimasu/thank you very much) especially ones with two young children in tow, but fast food in Japan is often very good quality and not at all expensive. There are plenty of Japanese food outlets where you can get a decent bowl of udon noodles or beef over rice and feed a family of four for around £10. And even when you come across Japanese versions of international dishes they just seem to do it so much better – the fast food chain Mos Burger is a good example. I hate McDonald’s and Burger King but the burgers and chips in Mos Burger are absolute perfection. We also tried some unusual combinations that just shouldn’t work but were delicious, such as deep fried shrimps with beef curry sauce (first with rice, and then bizarrely inside a doughnut!!!). Anyway, this week in an attempt to inject some Japanese flavours in my lazy (what time is it?) cooking I’ve attempted to recreate a sesame salad dressing that often came with set menu side salads in Japan. 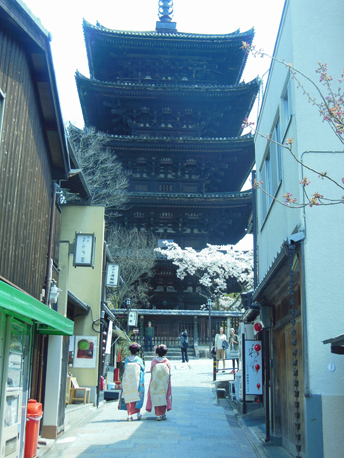 My next step is to get a bit more adventurous and so I have just ordered a couple of Japanese cookbooks from Amazon. My dream is to learn to make my own udon noodles and authentic yakitori but in the meantime here’s my simple Japanese style salad dressing recipe. Put all of the above ingredients into a jam jar and shake vigorously. Pour over your salad. 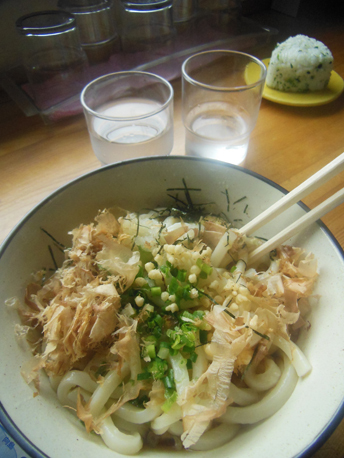 Simple udon noodles for lunch – I will learn to make these.